A true landmark of a pioneering spirit, the Mile High Swinging Bridge welcomes all visitors to admire 360-degree panoramic views from Grandfather Mountain. The bridge was built in 1952. The former North Carolina Tourism Director Charles J. Parker coined the name &rdquo; Mile High Swinging Bridge&rdquo; at the Bridge&rsquo;s dedication in 1952. The term &ldquo;mile high&rdquo; refers to the structure&rsquo;s elevation above sea level (5,280 feet). The term &ldquo;swinging&rdquo; refers to the fact that suspension bridges are free to sway. The bridge was rebuilt in 1999 using the original towers. The cables, floor boards and side rails were all replaced using galvanized steel. One of the main advantages of the modern building materials is that they do not have to be painted. 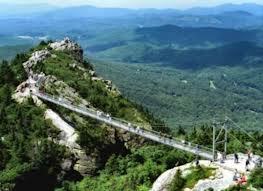 Now Grandfather Mountain employees will not have to hang out over the gorge to paint the span. Whether you cross it to challenge yourself, for the scenery, or to admire this engineering masterpiece, the experience will make your trip to Grandfather complete. A1 Mountain Realty offers many options for you and your family. Our mountain property offers a variety of life styles to please everyone. Whether you&rsquo;re looking for a Ashe County family vacation home or a getaway from the hustle & bustle of city living you can find it here. From NC Mountain Luxury Home to an NC Mountain Log Home, large tracts of NC Mountain Land, NC Mountain Lots and everything in between. Let A1 Mountain Realty be your guide for all your buying or selling real estate needs. View all our listings from our website www.a1mountainrealty.com or do a MLS search for any type property in the High Country. ← Ashe County Corn Maze!